My kids are really into Minecraft, and are interested in mods. Here’s a quickstart to getting an OS X dev environment set up with IntelliJ IDEA. Go to the Minecraft Forge downloads page. In the “Download Recommended” section, click on the “Mdk” icon. You’ll be redirected to an ad-based download page. it to begin the download. These are safe to ignore. Alternately, you can register your root git and link the gradle projects so IDEA stops nagging you. like a “play” triangle, click the drop-down, and choose “Minecraft Client”. Click the (now active) “Run” button. “Example Mod” as one of the mods. You’re now ready for Minecraft mod development. The other day I needed to log the API calls made from my Docker client to debug a difference in behavior between the docker command-line tool and the docker-py Python client. Here’s how I did it. The IP address of your boot2docker instance may be different, you can do boot2docker ip to find out what the IP is onyour system. Note that we’re hitting localhost (127.0.0.1) and not the IP address of the boot2docker instance. When you interact using the docker client, the requests and responses should be captured by mitmproxy. Hit “tab” to toggle between request and response, and hit “B” to save the request or response body that you’re currently viewing. There are lots of interesting timeseries data in software systems: events that occur over time such as numbers of users signed up, or errors of a certain type. I like visualizing these as a counting process, which is a cumulative count of the events over time. Once upon a time, I would’ve done this in R, but I want to learn pandas so I can do more with IPython notebooks. However, I don’t want to give up R’s excellent ggplot2 library. Fortunately, there’s a Python port. Here’s an IPython notebook that shows an example of a cumulative plot. 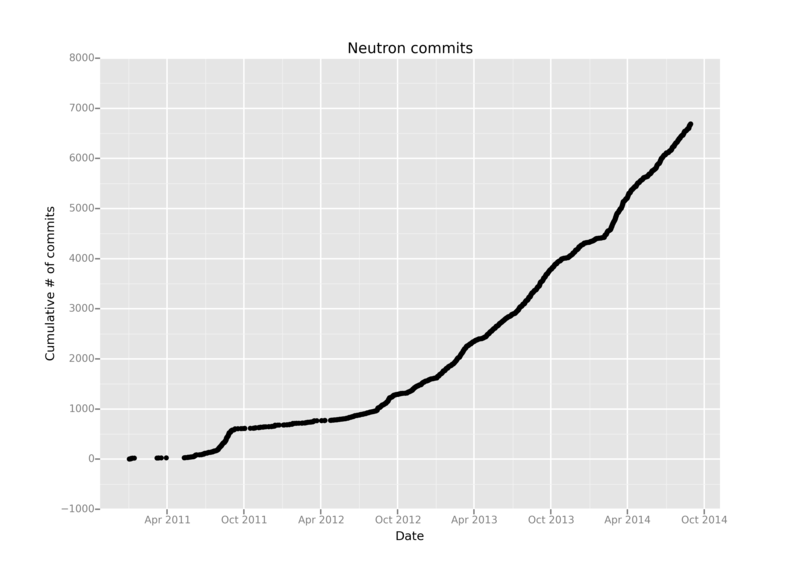 The example data I used is the commit history of the OpenStack Neutron project. I suspect there’s a simpler way to do the data manipulation with pandas, but I’m just a beginner with the library. Here’s how you can mitmproxy on OS X to see which URLs the ec2-api-tools are querying against. export EC2_JVM_ARGS="-DproxySet=true -DproxyHost=127.0.0.1 -DproxyPort=8080 -Dhttps.proxySet=true -Dhttps.proxyHost=127.0.0.1 -Dhttps.proxyPort=8080"
I wanted to play with mod_auth_openid on my Macbook Pro. OS X ships with Apache installed, so all I needed to do was build the module and edit the Apache configuration. I wasn’t able to build mod_auth_openid from the git repository because of issues with autotools on OSX, but I was able to build from the latest release tarball (in this case, mod_auth_openid-0.7.tar.gz). Then it was just configure, make, sudo make install. Voila! An OpenID consumer on my laptop.